Ismerje meg, hogyan tudja beállítani és használni a legkorszerűbb mobil, VoIP, SMS és web funkciókat. To get the most up to date information, please fill in the following form. The best way for your customers to reach you is using your corporate website. You can place a webphone on your website with the help of a webphone outside line. This way your customers can call you. There is also a webphone extension with which you can enable your employees to call each other within the network of the company by placing the webphone on a website they can access. By connecting a webphone to the Ozeki Phone System XE you can make it possible for your customers to easily reach your support staff. They only need to have a microphone connected to their computer to talk with your employees. You can choose from various types of webphones provided by the Ozeki Phone System XE. 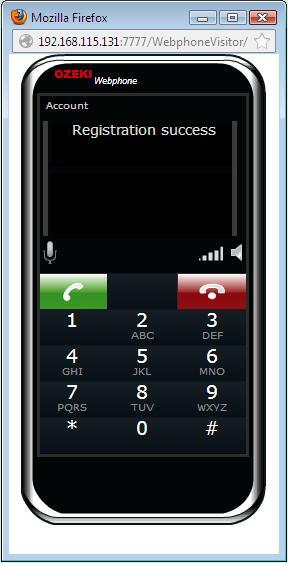 The webphone extension allows you to make phone calls directly from a webbrowser. The HTML user interface and the functionality can be customized according to your needs. With it, your employees can log into the company network through a website and make calls not only towards the phone numbers of the inner network but also to outside numbers. In the latter case, they will be able to make business calls from the budget of the company. How to connect analog or VoIP desktop phones to the Ozeki Phone System XE. © Copyright 2012 - 2019. Ozeki Informatics Ltd.